"Morphean Empires" is the first release from Wolfheart featuring The Malavita Antisocial Club. And who or what is Wolfheart featuring The Malavita Antisocial Club you might be asking? That's a really good question with a really long answer. But, seeing as time is precious and all that jazz (or in this case METAL!) I'll just keep this short and sweet in order that we can get to real meat of this piece. Stripped to it's core, Wolfheart featuring The Malavita Antisocial Club is, for all intents and purposes, a solo outing for one Wolfgang Süssenbeck (Angry Nation, Citizen X, Darkside, Demolition, Midgard.Upgraded, Noohoorsh, Waves). On the ultimately impressive (and if we're to be bloody honest here rather lengthy*!) "Morphean Empires" vocalist/keyboardist Wolfgang Süssenbeck has teamed up with fellow Darkside member Jaroslav "Jaro" Lukac (guitars), and bassist/drummer (Dark Lunacy, Darkside, Tapewhore, ex-Demolition (live), ex-Infernal Poetry, ex-Priority, ex-Resurrecturis ) in order that he might unleash (FIERCE!) melodic death metal onto the unsuspecting masses. With guest musicians (and fellow followers of the almighty power cord!) 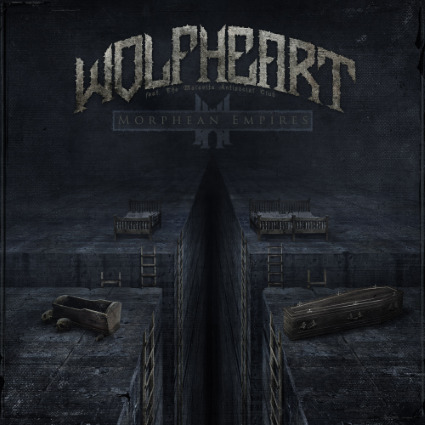 Thomas Schmoll (guitar) and Walter Oberhofer (guitar) along for the ride, "Morphean Empires" ends up being a grand experience and one that should not be undertaken unless you are fully prepared for the eventual onslaught that will follow! Sure, "Morphean Empires" is Wolfgang Süssenbeck making good on a promise that he made to himself some 30+ years back**, but it's also a pleasant little jog through a METALLIC minefield where every new step could find you blown to pieces and left for dead!! In other words, "Morphean Empires" is a damn fine listen especially for those who like their death metal to be melodic, technical and above all else terrifying! Only time will tell if Wolfheart featuring The Malavita Antisocial Club is the real deal or a one and done project. Hopefully it's the former and not the latter as there is a lot of good ideas floating about on this uncompromising release. This one definitely comes stamp with my seal of approval. And as to the band's decision to cover The Doors on "Morphean Empires"? Well, we already had the keys to the kingdom, but now we get all the gold that comes with it!!!! *The promo I was sent included 21 tracks(!) for a run-time of over an hour and a half! ** Wolfgang promised himself that at some point in the future he would release a solo album. Well, the future is now and by the sounds of this bloody curtailing release everything is on fire! Saturday Singles: Devolve-"Refuse To Die"